Birdwatching…not just for the birds. Birdwatching...not just for the birds. Love Birdwatching, but don’t know where to go? Then let the Indiana Audubon Society be your guide. Check out Indiana’s best locations on their birdwatching map. One of the Society’s goals is to increase advocacy and awareness of bird and habitat protection. So, in 1998, they instituted the Audubon Important Bird Areas program, which to date has 26 certified locations statewide. 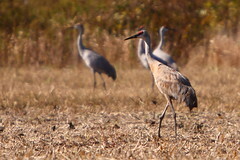 Picture: Sandhill Cranes migrate through the Jasper-Pulaski Fish & Wildlife Area, one of Indiana Department of Natural Resources’ many properties. It’s an amazing sight…almost 10,000 stop over during the fall migration. It’s really cool!